With the addition of the new Eco BodyChoice massage chair, BestMasssage looks to continue its mission to provide the lowest prices and an ever growing selection of massage products to its customers. BestMassage.com has come up with a solution for massage therapists feeling the effects of hard economic times with its new massage chair, the Eco BodyChoice. This massage chair claims to be ideal for students, new users and practitioners on a budget and normally costs $159.00, but is currently on special discount price for $89.00. “We know that when new practitioners start out, it is difficult for them to spend a lot of money on massage tables, massage chairs or massage supplies. We also realize that financial times are tough, even for massage therapists and bodyworkers. That is why we wanted to offer the Eco BodyChoice-- a high quality portable massage chair without the large price tag,” claims Amona Buechler, owner of BestMassage.com. With the addition of the new Eco BodyChoice chair, BestMassage looks to continue its mission to provide the lowest prices and an ever growing selection of massage products to its customers. BestMassage claims the Eco BodyChoice massage chair to be lightweight, extremely comfortable and easy to set up as well as store. Weighing at only 20 lbs and thanks to its iron frame and legs, the Eco BodyChoice chair can support a dynamic weight of up to 330 lbs. It also comes with a fully adjustable armrest, chest rest, and headrest. Even at such a low price, BestMassage has included three free accessories: an adjustable headrest, a face pillow and a carrying case. 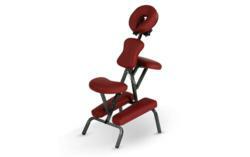 The massage chair comes in three stylish colors to choose from: black, cream and burgundy. The Eco BodyChoice massage chair is now available for purchase online with a limited time special offer at BestMassage.com.